Friends, we've been getting busy with a paintbrush over here. Right before Christmas, I painted our rental house's dining room a perfect gray. 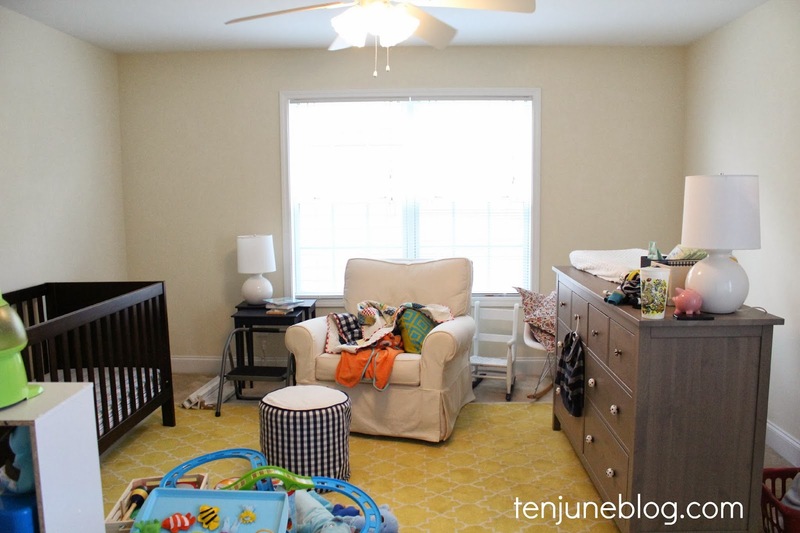 Now, we've moved on to the bedrooms for the bambinos! Last week, my sister and David and my 8.5 month belly painted HDawg's room and our little lady's nursery. By the way... I'm thinking of giving our soon-to-arrive little girl a blog alias of Little Lady June... Little June... June Dawg... you know, kind of like the official little gal behind this blog. For the record, her name is not June, just a fun play on the blog. What do you think, LLJ in da house? 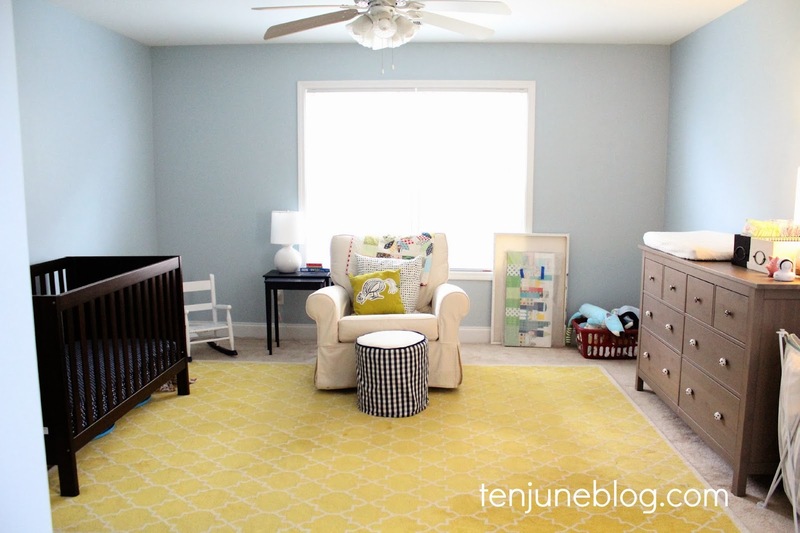 But for now, let's put June Dawg's nursery on the back burner. Today, I'm excited to reveal HDawg's newly painted bedroom. It's beautiful! 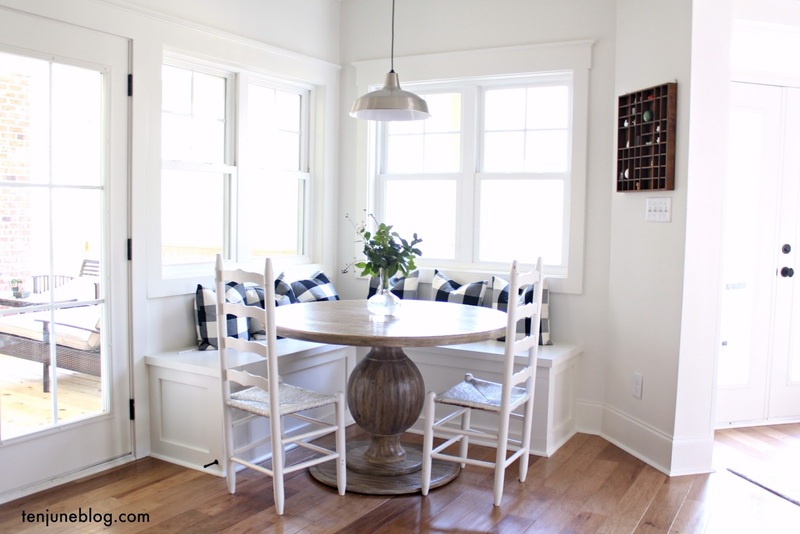 I used my absolute favorite paint- Sherwin Williams' Emerald brand. I've used this paint for years now and am smitten. Not only is it non-VOC (even the colorants!) which is much safer for us preggos and for the kiddos, but it's got a scrubbable finish and goes on like buttah. Love, love. 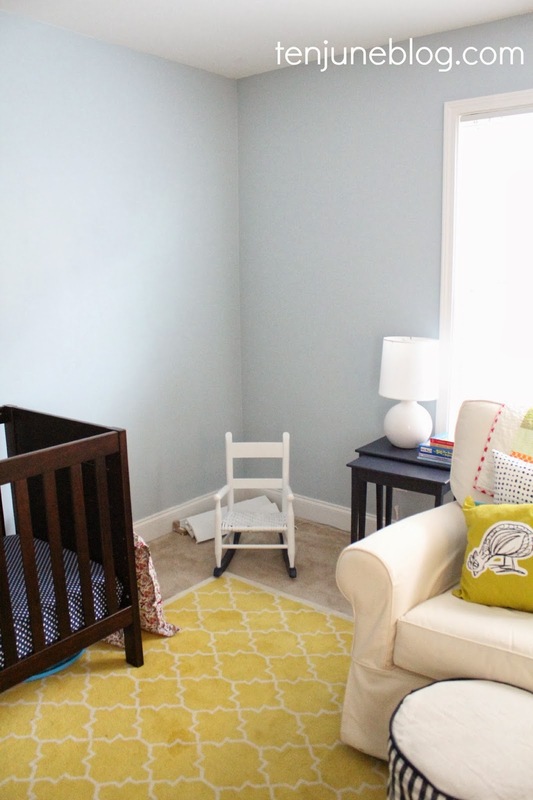 The color I used for H's room is what I officially declare to be the perfect little boy blue paint color: Sherwin Williams Sleepy Blue. 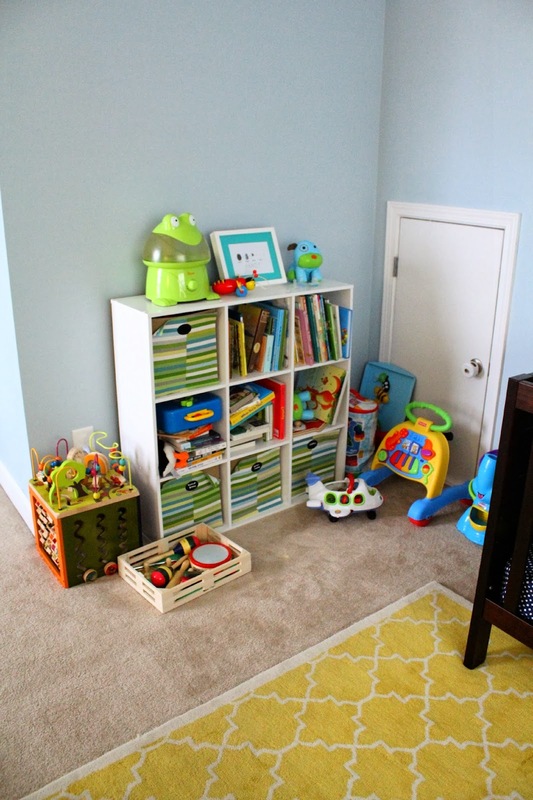 We actually used this color in HDawg's original nursery at our old house. With this color on the walls here at this rental house, the room truly feels like home. It's amazing what a little paint can do on the walls. Oh, here are the before shots of the room. And ahhh, with the Sleepy Blue. As renters, it can be a tough choice to invest in the time and money to paint the walls. David and I plan to be at this home through at least October, and possibly another year after that, so we have plenty of time to enjoy the paint colors. Also, we got the paint colors approved by our landlord, which means that we don't have to repaint the colors before we move out. Win win. I still need to hang art on the walls (you can see most of H's art pieces laying on the floor around the room!) and create a few other special spots around the room. 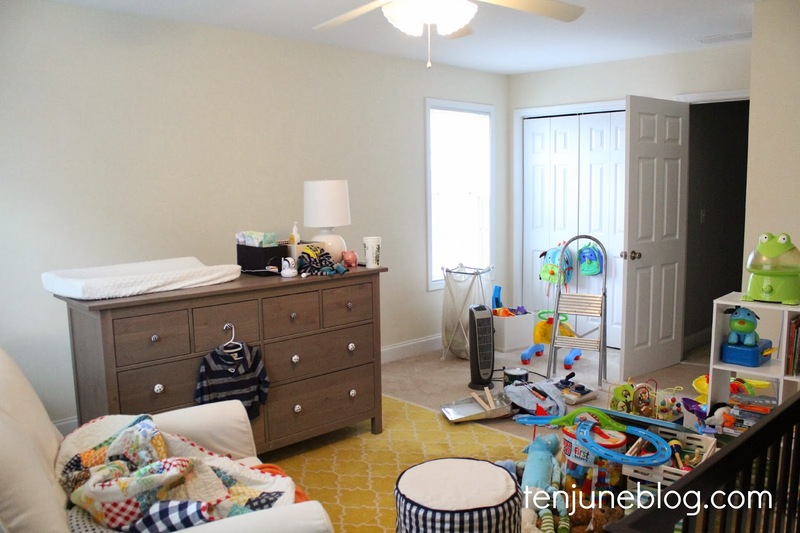 David and I plan for this large room to be the main playroom for both of our kiddos, so I want to make sure it's not only cute but functional for special playtime, as well. I definitely want to create a reading nook in this little corner. And, of course, I need to organize the toys and books over here on the bookshelf. Did you notice HDawg's new crib?! We love it. 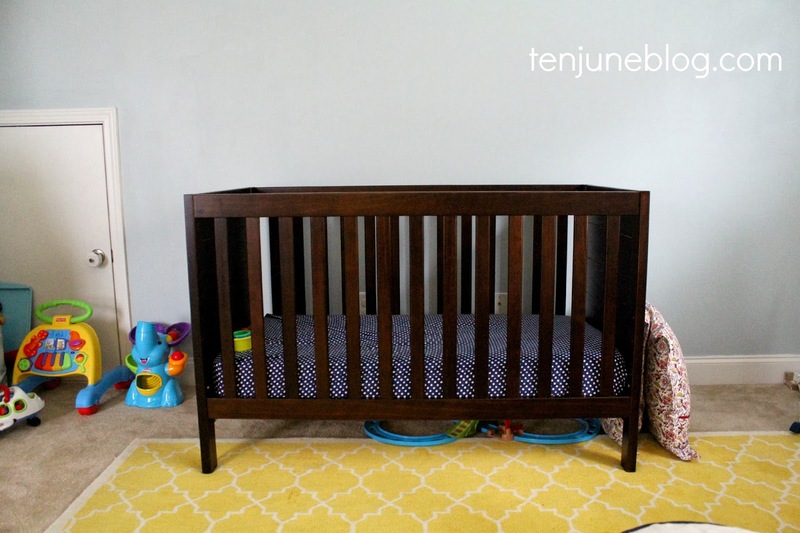 If you're wondering why we switched the crib up or for more details on the crib, check out this post. It was a huge room to paint, but luckily my sweet sister, Callie (who just graduated from college and got her first job- she starts today! ), came and helped me knock this out in a couple of days. She's the best-est! Every time I walk into this room, I'm in love. 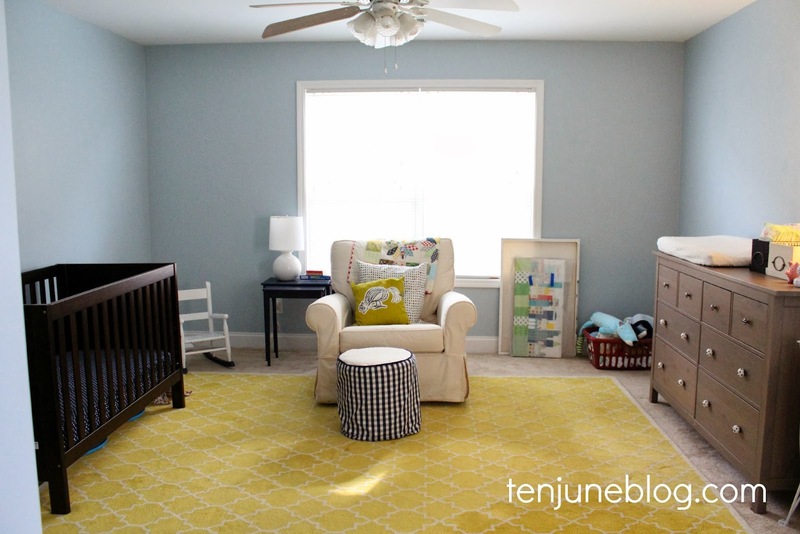 Not only is the color the perfect little boy blue paint color, but I feel that it really brings his room together and makes it feel like home. Way to go, paint! 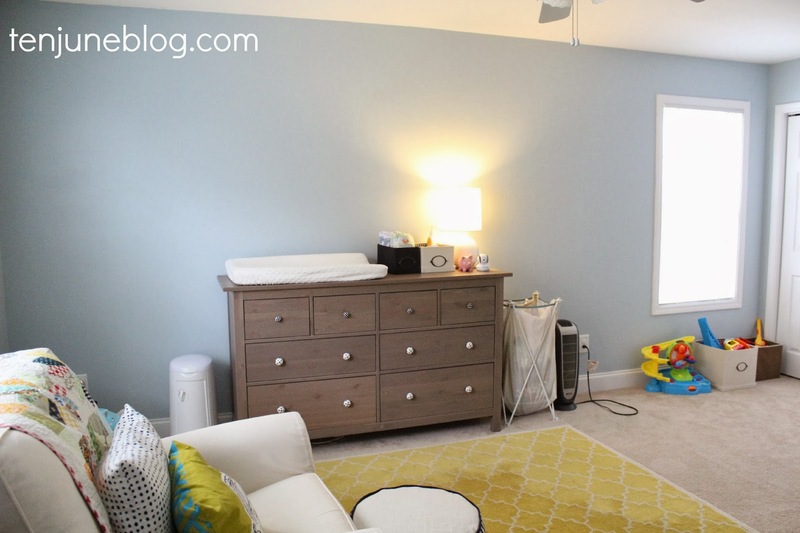 If you're interested in learning more about anything you see in HDawg's bedroom, check out his original nursery reveal post or his nursery source list post. FYI, the paint I described in this post was provided to me by Sherwin Williams. Aside from the product, I was provided no other compensation for using or writing about this paint. All opinions and information that I share are completely my own. Totes McGotes. Looks so good, it really is the perfect blue. and love the nickname LLJ. That is an awesome blue! It looks great with the rug! ditto what michelle said- i love it with the rug! what a soothing blue! i am pretty sure that is the blue we used in our old house's living room! Hello! I am a new-ish reader and love your blog. This post made me think of my grandma had two fantastic best friends both named June. It is one of my most favorite names - they were southern and fun and I loved them so much. I can't believe you found out this late in the game about your baby girl and I can't wait to hear how her nursery turns out! The big boy room color is fantastic. I love how it turned out!!! And I have to agree--it just might be the perfect blue. Love the name Little lady june....cute cute. Love that shade of blue! So perfect for that cutie HDawg! 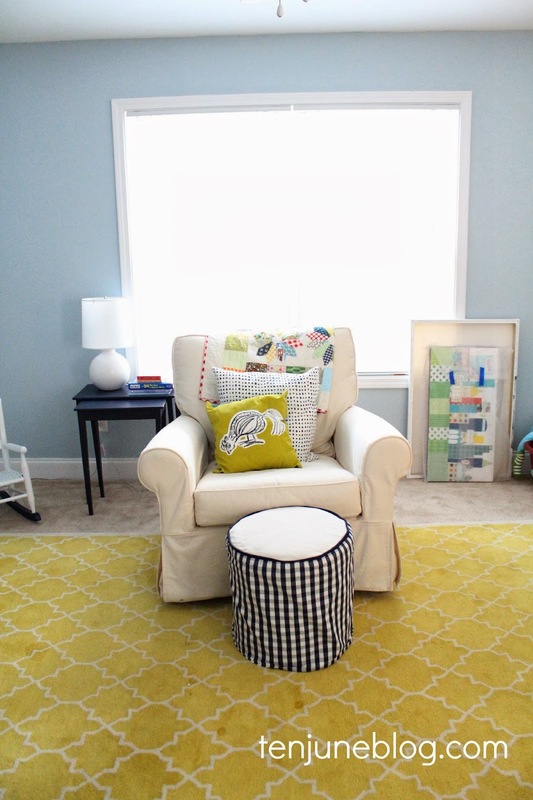 That color is perfect, especially with the yellow moorish rug! What a beautiful combo. Love Emerald brand paint! I've really become a fan of SW lately! That really is the perfect little boy blue paint color! Gorgeous colors! That's great that your landlords approved the color. It's classic - love it!